Common Grackles are blackbirds that look like they’ve been slightly stretched. They’re taller and longer tailed than a typical blackbird, with a longer, more tapered bill and glossy-iridescent bodies. 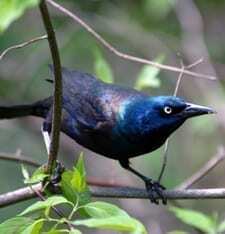 Grackles walk around lawns and fields on their long legs or gather in noisy groups high in trees, typically evergreens. They eat many crops (notably corn) and nearly anything else as well, including garbage. In flight their long tails trail behind them, sometimes folded down the middle into a shallow V shape.